Located at the corner of Chagrin River Road and South Woodland Rd. (Rt. 87). The Polo Field hosts a variety of horse and dog shows/events during summer months. The Hunter Jumper Classic is organized by the Chagrin Valley PHA Horse Show, Inc., the Cleveland Grand Prix is the highlight of the Classic. The Cleveland Grand Prix debuted in 1965 at the Polo Field and was the first jumping grand prix in North America. Whether it be for a polo match, for a large, organized horse show, or just casual riding, the Polo Field is a place in Cleveland Metroparks known for watching and doing horseback riding. When organized horse or dog shows are not using this space, you’ll find walkers and joggers, dog owners and people just out soaking up the sunshine. 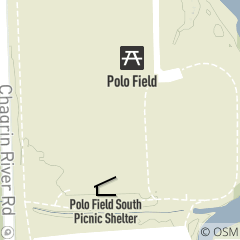 The Polo Field is also a place where you can park and hike south along the Chagrin River floodplain.